Why PhoneGap and what is hybrid mobile application? Don’t worry if you are quite new to hybrid mobile application development and all of this doesn’t make much sense yet. I’m sure that once you follow this tutorial further things will start to come together. First step. 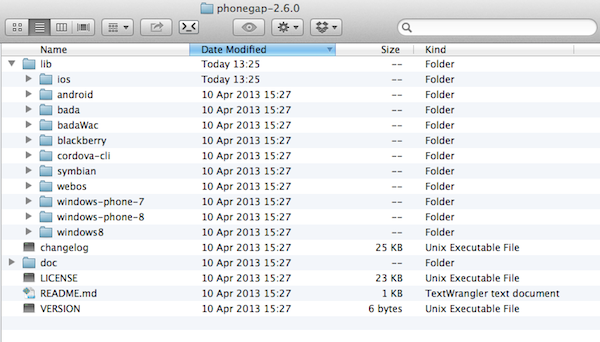 Downloading PhoneGap framework and starting the project. At the time of writing this tutorial PhoneGap has over 1200 registered developers in their developer directory. You can also join the developer community and discussion groups but this is not necessary in order to download the recent version of framework. Just go to the download page and get the most recent version of the framework. At the time of writing I have downloaded version 2.6.0. Once downloaded and unzipped project has several directories in it including documents, change log and actual libraries created for all main mobile operating systems. For our purpose we will need PhoneGap library for iOS devices as the first version of our application will be developed for this mobile OS. On the official PhoneGap website there is an extensive guide on how to implement PhoneGap library into iOS projects. Based on this guide we need to do the following steps to get started. and it has nicely created YummyThings XCode project. Yes, I know, yummy.. But more about this later. 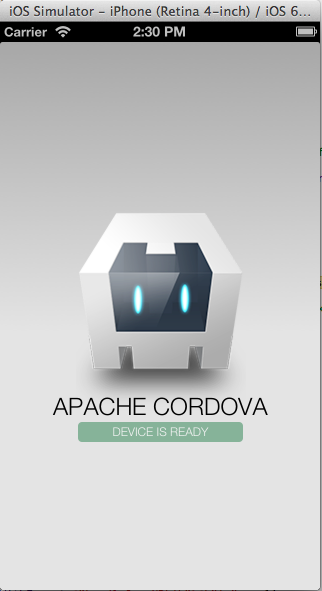 useSplashScreen is deprecated: Deprecated in Cordova 2.5. It has to do with the use of viewController.useSplashScreen iOS View Controller properties and it seams that PhoneGap wants us to use their specific plugin (hm.. I just used out of the box code). Not a big deal and we can fix this warning later. In the mean time I have launched application in iPhone simulator and it started nicely. This means we are up and running. Now then we have our initial iOS app project setup and running with PhoneGap it’s time to talk a little about the application we are going to develop. There is a nice site online called ProgrammableWeb. Its packed with API’s and has big list of them summarized and available to use for developer projects. After some searching I found API provided by Yummly.com folks. On Yummly web site visitors can find recipes for many yummy meals based on ingredients they like. Their API makes it easy to do this search in programmatic way. Sounds like a great fit for our YummyThings mobile application. It will give users an option to choose the ingredients they like, and get a bunch of nice recipes of yummy dishes. We will even store ingredients and recipes on the actual device so app users can view them later or share with their friends. You will need to obtain an API key from Yummly folks in order to work with their API, and there is a free plan with up to 500 API calls per day. More than enough for our sample application. This is the end of part one. We have looked at what PhoneGap and hybrid mobile applications are, successfully created our initial PhoneGap project for iOS and tested it with XCode and iPhone simulator. Next time we are going to look through the key files in the project, implement functionality for web service communication and consuming data from Yummly APIs. I hope you are looking forward. If you have any questions or feedback leave them in comments section under the post. It’s Very Nice Article for new user in Phonegap. Please post the same article for android because I don’t know the iPhone. Thank you Saul for the useful share. PhoneGap is really excellent cross-platform framework. It becomes the job very easy developing native application on six mobile platforms with big three web technologies. The best part of this tool is that it offers several native platform implementations which are very useful for the developers to wrap the html5 into native binary. i appreciate for the complete guide. Good to hear you found it useful! Good work. I know how hard is to write a workshop and how much take it takes. Thanks for sharing with us. Thanks for good feedback @after2050:disqus and I hope this tutorial was useful!